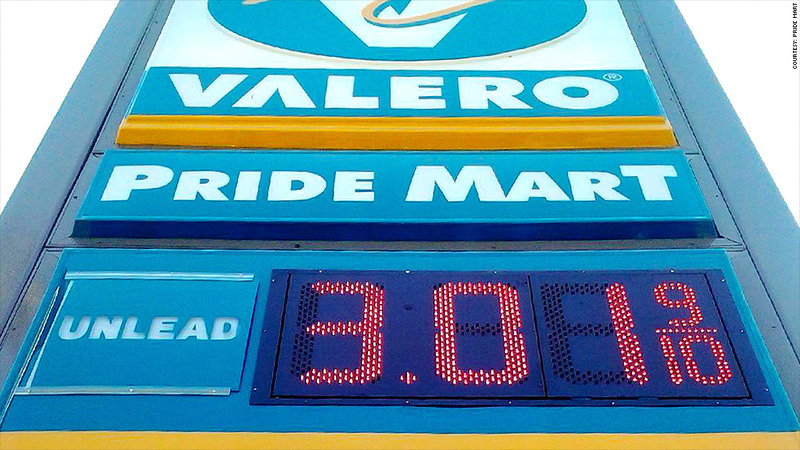 Gas prices fell below $2 a gallon at a station in San Antonio on Friday, making Texas the second U.S. state where prices have dipped that low this week. The Petronic gas station on Spicewood Drive is selling regular gas for $1.99 a gallon, according to GasBuddy.com, a website that tracks gas prices nationwide. The average price for a gallon of gas in Texas is $2.48. On Wednesday, a gas station in Oklahoma City became the first in the nation to sell gas for less than $2, a level that most drivers haven't seen in years. Now, there are three stations in Oklahoma with prices below $2, including one that sells gas for $1.89 a gallon. Gas prices have tumbled this year on the heels of sharply lower crude oil prices. The price of a barrel of U.S. crude oil is down 33% so far this year. Related: Is 2015 the year when the oil crisis ends? The current national average price for a gallon of gas is $2.71, down 56 cents from a year ago, according to data from AAA. That's the biggest year-over-year drop since 2009 and AAA estimates that drivers are saving $200 million per day as a result. Still, not all Americans will likely see gas prices below $2. That's because many states have high gasoline taxes. While prices could fall an additional 15 to 20 cents, AAA says oil prices would need to fall another $25 to $30 a barrel for the national average gas price to go below $2 a gallon.